Several different models of Hasselblad cameras were taken into space, all specially modified for the task. The Hasselblad cameras were selected by NASA because of their interchangeable lenses and magazines. Modifications were made to permit ease of use in cramped conditions while wearing spacesuits, such as the replacement of the reflex mirror with an eye-level finder. Modifications by NASA technicians were further refined and incorporated into new models by Hasselblad. For example, development of a 70mm magazine was accelerated to meet the space program. The first modified (in fact simplified) Hasselblad 500C cameras were used on the last two Project Mercury missions in 1962 and 1963. They continued to be used throughout the Gemini spaceflights in 1965 and 1966. A general program of reliability and safety was implemented following the Apollo 1 fire in 1967, addressing such issues as reliability and safe operation of electrical equipment in a high-oxygen environment. EL electric cameras were used for the first time on Apollo 8. 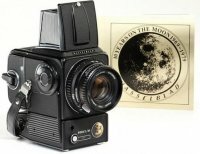 A heavily modified 500 EL, the so called Hasselblad Electric Camera (HEC) was used from Apollo 8 on board the spacecraft. Three 500EL cameras were carried on Apollo 11. An even more extensively modified Hasselblad EL Data Camera (HDC), equipped with a special Zeiss 5.6/60 mm Biogon lens and film magazines for 150–200 exposures, was used on the Moon surface on the Apollo 11 mission. All following NASA missions also had Hasselblad cameras on board. The photographic equipment and films used on the five subsequent flights were similar to that taken on Apollo 11. On Apollo 15, the 250mm telescopic lens was added. During the Space Shuttle period cameras based on the 500 EL/M, 553 ELX, 205 TCC and 203 FE have been used.